Owning a swimming pool in Arizona is the very definition of living the good life. With a state that gets blisteringly hot, arid summers, there’s nothing quite as blissful as being able to change and hop into a pool for a relaxing swim, or lounge in the water, in the comfort of your own home. While it’s not true of all of Arizona, especially the northern end of the state, the area we live in, Mesa, near Phoenix, definitely gets the kind of heat that can lay people to waste if they’re not careful. Temperatures here routinely break 100, but it doesn’t matter if it’s a “dry heat” when the wave hits hard, and temperature are above 110° F. Hot is hot! That’s why swimming pools in Mesa can feel like a sinful luxury on some days, and if you’ve worked hard and earned that pool, you should enjoy it! But if you’re thinking about getting a swimming pool built in your home, you’ve got a lot of choices ahead of you. One of the big questions you’ll need to ask before any digging starts in your yard, is what kind of pool do you want? There’s a lot of debate between saltwater vs chlorine pools, but which one works for you? In the debate of saltwater vs chlorine, it’s important to understand what the big differences are. So let’s take a look at the more common choice first, chlorine. This is something you should probably already be familiar with if you’ve ever hopped into a public pool in Arizona or other parts of the country. Chlorine is actually a pretty common choice in pool alternatives, but that doesn’t necessarily make it the superior choice. A chlorine pool is one where chlorine itself is deliberately added to the water whenever required in order to ensure proper chemical balance. The reason that this is done is because the chlorine, once present, starts to break down into hypochlorous acid, and hypochlorite ion. These two substances destroy the structures and enzymes inside cells, oxidizing them and rendering them harmless. In other words, they kill a whole host of harmful germs and bacteria. This is where the debate gets a little confusing. A saltwater pool will also have chlorine in it, and that is provided by the saltwater itself! However, the two types distinguish themselves in terms of method. With saltwater vs chlorine, a saltwater pool creates chlorine through a process known as electrolysis, where electricity is actually run through a compound. When electrolysis occurs in saltwater, it causes a chemical reaction that creates and release chlorine into the water. So in this sense, the swimming pool debate is unclear. They both create chlorine! So why choose one over the other? Your preferences are going to be the deciding factor in whether to get a saltwater vs chlorine swimming pool, and one of the first places your preferences will come to bear is cost. With a chlorine pool, you’re going to pay less upfront. Chlorine pools are cheaper than saltwater pools to build because a saltwater pool requires, in addition to a pump and heater, a saltwater chlorinator or generator must also be installed into the pool. A chlorine pool doesn’t require this extra piece of equipment, nor do you need to pay the additional electricity over the months and years to keep that generator running. However saltwater vs chlorine saves some cost in the long run too! Even though the chlorine pool is cheaper to build, you’re likely to experience more recurring costs as time goes by. And that’s because of the chlorine itself! The chlorine in your pool needs to be regularly replenished in order to remain safe, so you have to keep buying more of it. When it comes to saltwater vs chlorine, the saltwater pool is constantly generating the chlorine itself. Another area where these pools differ is in the way maintenance works for them. Chemical levels need to be carefully monitored and maintained in a chlorine pool, and it’s recommended that you stay attentive in watching these levels. The much higher concentration of chlorine added this way can be “fussy” and require a lot of adjusting to remain safe. Saltwater pools don’t require the same degree of attentiveness, and can generally “look after themselves” a lot better, so people that want less maintenance might be tempted to go with saltwater pools. However, saltwater pools may sometimes require maintenance in other ways. Salt is a corrosive substance, and so if salt gets into the air and then settles, it can rust out metal, such as the ladders and handrails to get in and out of pools, or even kill plants like grass, causing them to brown and whither. 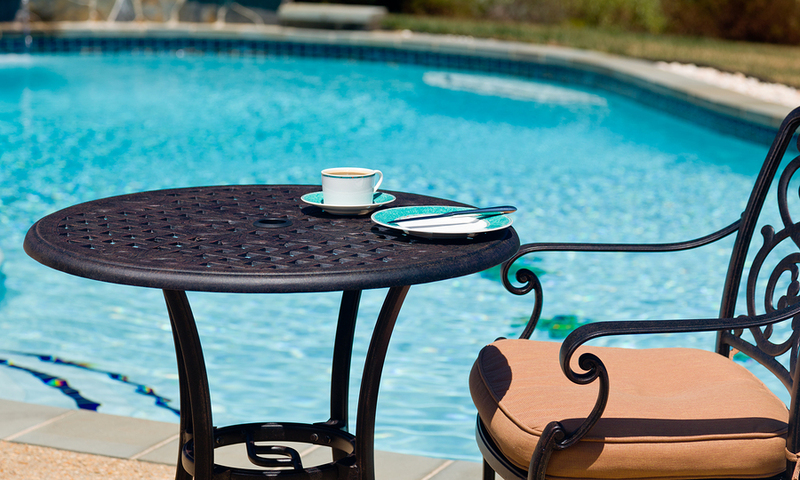 If you’re not sure of which pool is right for you, come to the experts with your questions. We can help you make the decision that best works for your home.